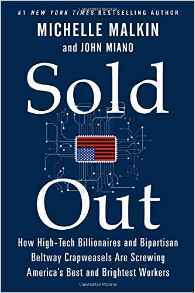 Michelle Malkin and I have written a new book, Sold Out: How High-Tech Billionaires & Bipartisan Beltway Crapweasels Are Screwing America's Best & Brightest Workers. Among much else we cover the I-Squared Act, S.153, (short for the "Immigration Innovation Act of 2015"). If you are an American worker, that bill is more appropriately called the "I'm Screwed Act". But there was so much other ground to cover, our book does not go into the bill's provisions in detail. Therefore, I thought I would take the time to do that here. Michelle Malkin discusses her new book. But first, some background on the book. We were fortunate to have good timing, with the book coming out after the media has partially lifted its blackout on reporting the politically incorrect fact that employers use foreign workers to replace Americans. It took months from the time ComputerWorld and a local TV station reported that Americans were replaced by H-1B workers at Walt Disney World to the time it was first reported in the New York Times. As I previously pointed out, the local newspaper, the Orlando Sentinel, reported on the Disney layoffs but, in a case of political correctness run wild, failed to report the fact that foreign workers were replacing those losing their jobs. Congress set up the H-1B visa program to help American companies hire foreigners with specialized skills, mainly in science and technology, for positions for which American workers with those abilities cannot be found. The goal was to help the economy expand and, ultimately, create more jobs for Americans. Sorry, wrong. The H-1B program was designed for employers to replace Americans with cheap foreign workers and to allow employers to abuse the system with impunity. In the space of a book, Michelle and I are able to go into the actual legislation to show how this was deliberately done. Politicians may say one thing, but they do another. We have a good example of that from the man who set the record for going native faster than anyone else after coming to Washington: Marco Rubio. In action, Sen. Rubio has become a steadfast supporter of replacing Americans with foreign workers. Now that the Disney story has blown up in his face, Rubio has been talking differently from how he has acted. Rubio now says that there ought to be protections for American workers in the H-1B program. But Rubio sponsored S.744 in the last Congress – the Gang of Eight bill – and now sponsors the I'm Screwed Act I-Squared Act. In Sold Out, Michelle and I examine in depth the provisions of S.744 to show what they actually do, and demonstrate how "Comprehensive Immigration Reform" was really a comprehensive fraud. It's the same with the I-Squared Act. Let's go through the provisions of this bill that Rubio is sponsoring. Section 101 of the I-Squared Act is titled "MARKET-BASED H–1B VISA LIMITS". This is where the legislation busts open the number of H-1B workers. To figure out what the bill does, you have to follow editing instructions in the bill and apply them to the existing text. I show deletions and insertions. Pardon the length here, but you have to see it to appreciate the level of mischief at work in the bill. To skip down to my analysis, click here. (i)	The Secretary of Homeland Security shall establish annual numerical limitations on approvals of initial applications by aliens for admission under section 1101(a)(15)(H)(i)(b1) of this title. (i) If the number of cap-subject nonimmigrant visa petitions approved under section 101(a)(15)(H)(i)(b) during the first 45 days petitions may be filed for a fiscal year is equal to the base allocation for such fiscal year, an additional 20,000 such visas shall be made available beginning on the 46th day on which petitions may be filed for such fiscal year. (ii) If the base allocation of cap-subject nonimmigrant visa petitions approved under section 101(a)(15)(H)(i)(b) for a fiscal year is reached during the 15-day period ending on the 60th day on which petitions may be filed for such fiscal year, an additional 15,000 such visas shall be made available beginning on the 61st day on which petitions may be filed for such fiscal year. (iii) If the base allocation of cap-subject nonimmigrant visa petitions approved under section 101(a)(15)(H)(i)(b) for a fiscal year is reached during the 30-day period ending on the 90th day on which petitions may be filed for such fiscal year, an additional 10,000 such visas shall be made available beginning on the 91st day on which petitions may be filed for such fiscal year. (iv) If the base allocation of cap-subject nonimmigrant visa petitions approved under section 101(a)(15)(H)(i)(b) for a fiscal year is reached during the 185-day period ending on the 275th day on which petitions may be filed for such fiscal year, an additional 5,000 such visas shall be made available beginning on the date on which such allocation is reached. (v) If the number of cap-subject nonimmigrant visa petitions approved under section 101(a)(15)(H)(i)(b) for a fiscal year is at least 5,000 fewer than the base allocation, but is not more than 9,999 fewer than the base allocation, the allocation adjustment for the following fiscal year shall be −5,000. (vi) If the number of cap-subject nonimmigrant visa petitions approved under section 101(a)(15)(H)(i)(b) for a fiscal year is at least 10,000 fewer than the base allocation, but not more than 14,999 fewer than the base allocation, the allocation adjustment for the following fiscal year shall be −10,000. (vii) If the number of cap-subject nonimmigrant visa petitions approved under section 101(a)(15)(H)(i)(b) for a fiscal year is at least 15,000 fewer than the base allocation, but not more than 19,999 fewer than the base allocation, the allocation adjustment for the following fiscal year shall be −15,000. (viii) If the number of cap-subject nonimmigrant visa petitions approved under section 101(a)(15)(H)(i)(b) for a fiscal year is at least 20,000 fewer than the base allocation, the allocation adjustment for the following fiscal year shall be −20,000. Let's state the obvious. The H-1B law is already unnecessarily long. The I-Squared Act makes the statute's text absurdly long. The most significant change (lengthwise) is that the fixed 65,000 annual quota gets replaced with a tangle of text. It takes a lawyer to figure out what is going on. The short version is that the bill immediately raises the quota to 115,000. But if the quota gets reached in any year, it automatically gets increased up to 50,000 a year. The actual effect here is that the quota immediately gets raised to 165,000. And the quota can keep rising by 50,000 a year until it reaches 255,000. Why not be honest and just make the quota 245,000? The reason is that the marketing strategy is to call this "market-based". In theory, it would make sense to have an economic basis for H-1B numbers. But implementing such a theory is like having mice trying to get a bell around the cat's neck. There is no way to predict in advance what the real economic need for workers will be. Plus, in an economic downturn, a truly market-based quota would cut off the supply of H-1B workers entirely (resulting in a cut-off of legal fees to immigration lawyers — something Americans would not stand for!). Instead, lobbyists just create this convoluted nonsense in the hope that they can fool the public into believing that the I-Squared Act is creating "Market-based caps ... that adjust to the demands of the economy" when they are really creating caps that adjust to the demand for cheap foreign labor. Another major increase is that visas for those who get graduate degrees from American universities are no longer counted toward the H-1B quota. The last major increase is that the visas under trade agreements do not count toward the quota. Because this is a relatively small number (6,800) compared the other increases (roughly 200,000), one might presume that there is anticipation of future trade deals that create more guestworkers. This section gives you a number of clues that the bill was written by lobbyists, rather the professionals. First, only lobbyists could have concocted the overly complicated quotas. Second, there are drafting errors. Notice the dangling "or" at the end of subsection (5). In any event, notice the absolutely needless complexity that lobbyists create when they write bills. Section 102 of the bill gives employers a twofer by allowing the spouse of an H-1B worker to work as well. Under that system, there would have to be a labor condition application for the principle alien on an H-1B visa, but the dependent spouse on an H-4 visa could work with no restrictions. Section 103 prohibits DHS from denying a renewal petition for an H-1B or L visa unless it gives a written finding that specific conditions exist. This is yet another hindrance of enforcement, designed to allow the system to be abused. This section also creates a 60-day grace period for H-1B workers who lose their jobs. Section 201 contains one of the two major changes in policy in the bill. Currently, student visas are strictly non-immigrant. The I-Squared Act allows aliens on student visas to come with the intent of immigrating, formally transforming student visas into a gateway to remaining permanently in the United States. The most radical change in the bill is in Section 301. In fact, it is one of the most radical changes in history to the immigration system. A bit of history first. When the current immigration law was created in 1952, it imposed national quotas based on historical norms. That was changed with little debate in 1965 to create an immigration system based on diversity. Each country is restricted to 7 percent of the green cards to spread the wealth around. The I-Squared Act increases that to 15 percent for family-based immigration and eliminates the limits altogether on employment-based green cards. That is a shift from the immigration system from having a diversity policy to having an India/China policy. Section 302 of the bill is rather bizarre and completely nonsensical (i.e., the work of lobbyists). The immigration system imposes a maximum number of green cards given out each year. In some years, for whatever reason, the maximum number of green cards is not given out. This section would add to the green card quota the greater of the number of all the employment-based green cards not given out over two decades (1992 to 2013) or 200,000 minus "the number described in subsection B". However, subsection B does not describe a figure. This could be interpreted as simply adding the greater of all the green cards not given out between 1992 and 2013, or 200,000. Nonsensical sections like this illustrate how senators like Hatch and Rubio are completely subservient to their lobbyist masters. The sponsors of the I-Squared Act have simply taken what lobbyists have given them and introduced the bill without even checking to see what the bill actually does. Section 303 of the bill contains huge increases in the number of employment-based green cards. It does this by exempting dependents from the caps. Currently, dependents are counted toward the various employment-based green card quotas; in 2013, they accounted for 53 percent of all employment-based green cards, so exempting them from the caps would roughly double admissions in these categories. It also exempts "aliens with extraordinary ability" and "outstanding professors and researchers" from the green card quotas entirely. And this is the big one. It exempts "aliens who have earned a master's or higher degree in a field listed on the STEM Designated Degree Program List published by the Department of Homeland Security on the Student and Exchange Visitor Program website from an institution of higher education (as defined in section 101(a) of the Higher Education Act of 1965 (20 U.S.C. 1001(a)))." This is where you can truly see the hand of lobbyists at work. There is no accepted definition of STEM. The I-Squared Act never even defines "STEM" for its own purposes. Even if it did, this provision does not require the "STEM Designated Degree Program List" to be restricted to any particular fields. This provision gives DHS the authority to exempt aliens with a graduate degree in any field from employment-based green card quotas. It is also ambiguous whether this applies to just American universities or foreign universities as well. That means the DHS could interpret this provision as authorizing anyone with any graduate degree from anywhere to be exempt from green card quotas. Vague provisions like this mean money for lobbyists to lobby DHS to get desired fields added to this list. Title VI of the bill contains the obligatory funding for education. I'll skip those provisions as they have little relevance for this discussion. That brings us to the protections for American workers that Marco Rubio says should be part of H-1B program. Where are such protections in Rubio's own bill? That is easiest part of the I-Squared Act to summarize: There are none. Rubio & Co. have created a bill that gives big money everything it wants (unlimited foreign labor) and nothing of what it doesn't want (protections for Americans). Rubio says one thing and does another. In others words Rubio & Co. have completely Sold Out. The Americans at Disney did not lose their jobs because Indian companies abused the immigration system. They lost their jobs because politicians in Washington sold out for campaign cash to make it legal to replace the Americans at Disney with foreign workers. Sold Out describes in detail how this was done. It is the book the presidential candidates do not want you to read. Note: This posting has been edited since its original publication.